What is the cheapest way to get from Orlando Airport (MCO) to Westgate Leisure Resort, Orlando? The cheapest way to get from Orlando Airport (MCO) to Westgate Leisure Resort, Orlando is to drive which costs $1 - $3 and takes 21m. What is the fastest way to get from Orlando Airport (MCO) to Westgate Leisure Resort, Orlando? The quickest way to get from Orlando Airport (MCO) to Westgate Leisure Resort, Orlando is to shuttle which costs $16 - $75 and takes 21m. 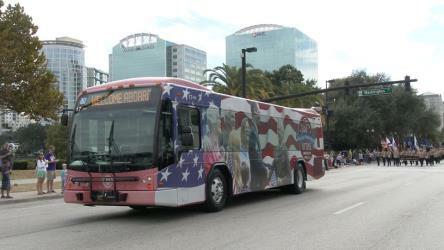 Is there a direct bus between Orlando Airport (MCO) and Westgate Leisure Resort, Orlando? 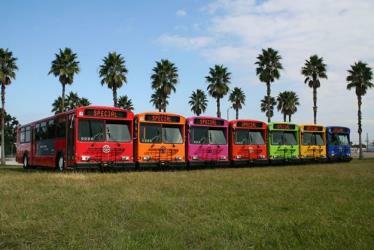 Yes, there is a direct bus departing from Oia Transfer Center and arriving at Sea Harbor Drive And Grand Vacations Way. Services depart hourly, and operate every day. The journey takes approximately 52m. How far is it from Orlando Airport (MCO) to Westgate Leisure Resort, Orlando? The distance between Orlando Airport (MCO) and Westgate Leisure Resort, Orlando is 10 miles. The road distance is 15.1 miles. How do I travel from Orlando Airport (MCO) to Westgate Leisure Resort, Orlando without a car? The best way to get from Orlando Airport (MCO) to Westgate Leisure Resort, Orlando without a car is to line 111 bus which takes 1h 17m and costs $2. How long does it take to get from Orlando Airport (MCO) to Westgate Leisure Resort, Orlando? The line 111 bus from Oia Transfer Center to Sea Harbor Drive And Grand Vacations Way takes 52m including transfers and departs hourly. Where do I catch the Orlando Airport (MCO) to Westgate Leisure Resort, Orlando bus from? Orlando Airport (MCO) to Westgate Leisure Resort, Orlando bus services, operated by Lynx Central Florida Transport, depart from Oia Transfer Center station. Where does the Orlando Airport (MCO) to Westgate Leisure Resort, Orlando bus arrive? 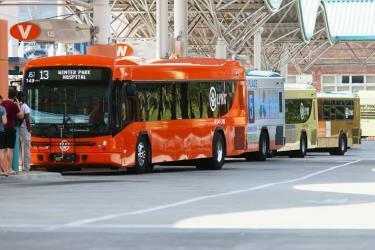 Orlando Airport (MCO) to Westgate Leisure Resort, Orlando bus services, operated by Lynx Central Florida Transport, arrive at Sea Harbor Drive And Grand Vacations Way station. Can I drive from Orlando Airport (MCO) to Westgate Leisure Resort, Orlando? Yes, the driving distance between Orlando Airport (MCO) to Westgate Leisure Resort, Orlando is 15 miles. It takes approximately 21m to drive from Orlando Airport (MCO) to Westgate Leisure Resort, Orlando. Where can I stay near Westgate Leisure Resort, Orlando? There are 8595+ hotels available in Westgate Leisure Resort, Orlando. Prices start at $135 USD per night. What companies run services between Orlando Airport (MCO), USA and Westgate Leisure Resort, Orlando, FL, USA? 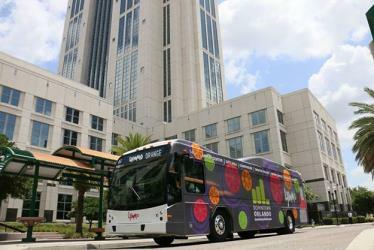 Lynx Central Florida Transport operates a bus from Orlando Airport (MCO) to Westgate Leisure Resort, Orlando hourly. Tickets cost $2 and the journey takes 52m. Rome2rio's Travel Guide series provide vital information for the global traveller. Read our range of informative guides on popular transport routes and companies - including Travelling Croatia’s Dalmatian Coast by boat, bus, car and train, The London Underground: Essential tips to navigate the Tube and Travelling to the UK: What do I need to know? - to help you get the most out of your next trip. Discover how to get to attractions and hotels near Williamsburg. Epcot (originally named EPCOT Center) is a theme park at the Walt Disney World Resort in Bay Lake, Florida. It is owned and operated by the Walt Disney Company through its Parks and Resorts division. Inspired by an unrealized concept developed by Walt Disney, the park opened on October 1, 1982 and was the second of four theme parks built at Walt Disney World, after the Magic Kingdom. Spanning 300 acres, more than twice the size of the Magic Kingdom park, Epcot is dedicated to the celebration of human achievement, namely technological innovation and international culture, and is often referred to as a "permanent world's fair". The park is divided into two sections: Future World, made up of eight pavilions, and World Showcase, themed to 11 world nations. The Walt Disney World Resort is an entertainment complex in Bay Lake and Lake Buena Vista, Florida, near Orlando and Kissimmee, Florida. Opened on October 1, 1971, the resort is owned and operated by Walt Disney Parks and Resorts, a division of The Walt Disney Company. It was initially operated by Walt Disney World Company. The property covers 27258 acres, featuring four theme parks, two water parks, twenty-seven themed resort hotels, nine non–Disney hotels, several golf courses, a camping resort, and other entertainment venues, including Disney Springs. Magic Kingdom is a theme park at the Walt Disney World Resort in Bay Lake, Florida, near Orlando. Owned and operated by The Walt Disney Company through its Parks and Resorts division, the park opened on October 1, 1971, as the first of four theme parks at the resort. Initialized by Walt Disney and designed by WED Enterprises, its layout and attractions are based on Disneyland Park in Anaheim, California, and is dedicated to fairy tales and Disney characters. Disney's Hollywood Studios is a theme park at the Walt Disney World Resort in Bay Lake, Florida, near Orlando. It is owned and operated by The Walt Disney Company through its Parks and Resorts division. Based on an idea by Marty Sklar, Randy Bright, and Michael Eisner, the park opened on May 1, 1989, as the Disney-MGM Studios Theme Park, and was the third of four theme parks built at Walt Disney World. Spanning 135 acres, the park is dedicated to the facets of show business, including film, television, music, and theatre, drawing inspiration from the heyday of Hollywood in the 1930s and 1940s. 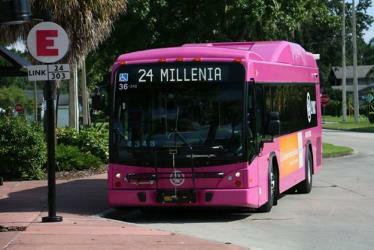 Rome2rio makes travelling from Orlando Airport (MCO) to Westgate Leisure Resort, Orlando easy. Rome2rio is a door-to-door travel information and booking engine, helping you get to and from any location in the world. Find all the transport options for your trip from Orlando Airport (MCO) to Westgate Leisure Resort, Orlando right here. Rome2rio displays up to date schedules, route maps, journey times and estimated fares from relevant transport operators, ensuring you can make an informed decision about which option will suit you best. Rome2rio also offers online bookings for selected operators, making reservations easy and straightforward.